RockSport has partnered with Greater Tahoe Gripworks to resole climbing shoes. RockSport will call you when your shoes are ready to be picked up. 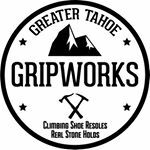 Learn more about Greater Tahoe Gripworks Resoles.